Raise your hand if you love teaching science? Talk about creating magic in the classroom. A little exploration can go a *long* way when trying to engage your learners and create a little (or a lot) of excitement. I have been posting a lot of updates on my Instagram account, and my experiments have created quite the buzz. We have been working on all things physical science which can be quite abstract. If you want for your students to truly "get it" and not just memorize terms (I call this word vomit), experiments are a must and application is key! We don't just want for them to have knowledge, we want for them to use it, right? Now, I will be honest...things get a little messy. However, I would rather the room get a little messy than their understanding. Am I right? You guys have posted the desire to know more, so I give you....science lately! This little gem can be found in my As a Matter of Fact unit. (You can learn more about that HERE!) These 5th graders loved it just as much! Procedures: Find the lab that we used HERE. 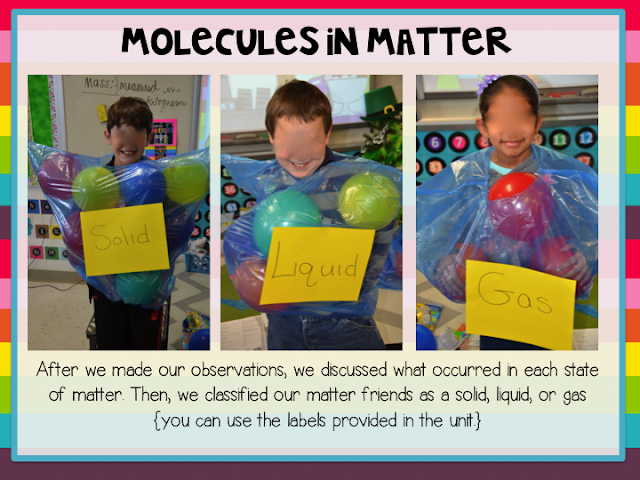 Next up, we discussed mass, volume, and density. 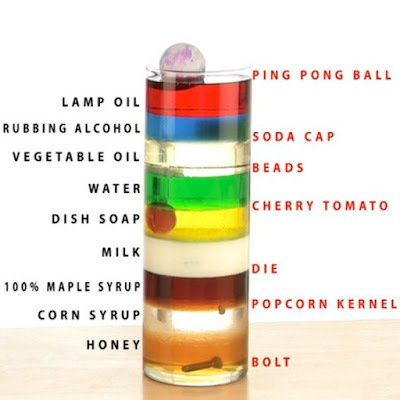 Here are two of my favorite ways to help students explore and grasp the concept of density because let's be honest...just having them memorize the term isn't going to cut it! It's way confusing. This layering lab is all over Pinterest. It's a great demo lesson for your class. 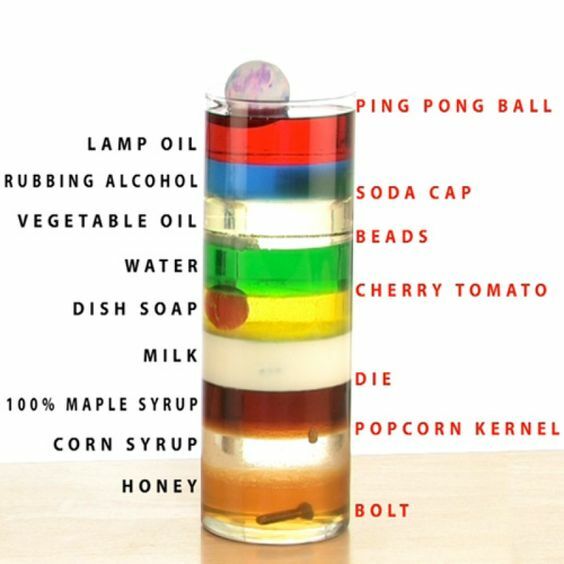 You simply layer the liquids for your kiddos in a large class jar or vase, and then allow students to drop a variety of objects and discuss density and buoyancy. Procedures: The students create a hypothesis for each experiment. Then they test each hypothesis to see if the liquids layer correctly. Note: This lab can be done as a demo or as lab groups. The students combine all of the fruits into a bowl and discuss the change. 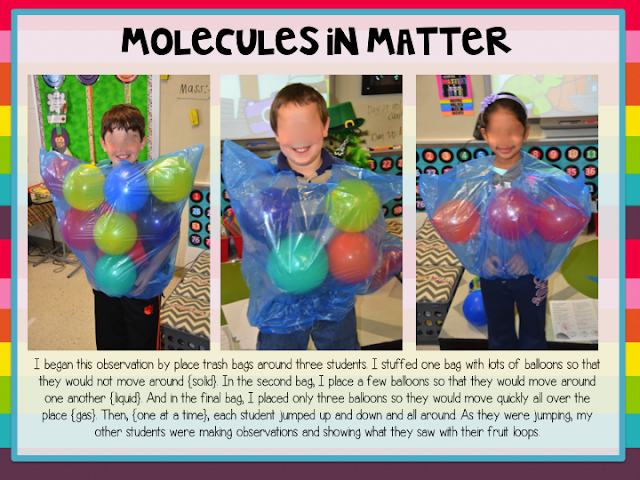 They should identify a physical change (mixture) because the fruits can be easily separated. Then allow students to mix the water with their powdered sugar in cup. The students explore the difference with this mixture. It can't be easily separated, yet you still have each individual ingredient and have not created a new substance. Use this concept to introduce a solution. The students then add the syrup to the fruit and combine their mixture and solution. Enjoy! Who doesn't love creating ice cream in a bag while learning about the properties of salt? I mean...count me in! Lab set up and procedures found HERE! We also calculated the temperature every 20 turns and created a line graph to chart our temperature change. If you live near a Krispy Kreme, they will give you free hats! Then you can grab my Salty Cream Template right HERE for you little ice cream creators! Glue it on top to create your soda jerk hats! During this lab, the students are exploring chemical changes using powders and liquids found in our kitchen...thus the chef hats! They will create tests by mixing mystery powders and liquids to see if the combinations result in new bonds being formed by the molecules (chemical changes occur). They should look for things such as fizzing, bubbles, temperature change, color change, odor, or gas production. Allow the students to perform 5-7 different tests. For each test, they will combine two powders of choice into a Ziploc bag. They will select one liquid and place about a tablespoon into a condiment cup. They will place the condiment cup on top of the powder and close the bag. Pour the liquid onto the powders and observe. They will discuss the changes that occurred and note both physical and chemical changes. Believe me when I say they will absolutely freak out over what they observe...multiple times! Alright guys! I think that's enough science to keep ya busy! Rock on, and I'll see ya next time! Oh and before I go, I have had tons of questions about where I purchased my goggles and lab coats! Here are some of my favorite science things!